Does anyone remember the moment in the musical 42nd Street when the leading lady is injured and the producer runs up to the fully prepared ingenue and says: “Sorry honey, we’re going to use the videotape?” Of course not, because Julian Marsh – in an admittedly fictional setting – grabs Peggy Sawyer, gives her a pep talk, and sends her on stage to become the star she deserved to be. But the former scenario was essentially what happened behind the scenes at Sunday’s US broadcast of the musical Rent, when a broken foot at the dress rehearsal sidelined the live show’s Roger, Brennin Hunt. The production team made the decision to use footage previously shot at the dress rehearsal, showing only the last 12 minutes or so live, restaged, so that Hunt could perform with his foot elevated. This mishap points up the inherent differences between theatre and theatre on TV. The latter is a hybrid, and it seeks to capitalise on the the ever-dwindling phenomenon of so-called ‘appointment television’: live programming that must be watched as it airs. When it comes to sports, such as the Super Bowl this Sunday, or awards programmes like the Oscars, part of the excitement of being live is that truly no one knows what is going to happen. Theatre thrives on immediacy and presence, yet it’s all about being able to do the same thing night after night, week after week, consistently and reliably. So how live must it be on TV? At a regular theatre event, if there’s a scenic glitch, the show pauses and ideally restarts. If an actor is injured or ill, there’s someone ready to take their place, unless it’s a situation on the scale of an actor’s fall during a preview of Spider-Man: Turn Off The Dark in 2010. But TV isn’t prepared for that level of uncertainty, unless it wants to become cruelly exploitative. With the recent trend of live theatre on TV, the goal is to capture spontaneity, but not too much. Very late in the broadcast of Grease, a golf-cart risked tipping over, providing a frisson of danger. But if it had actually happened, it’s all anyone would have remembered. Whatever one makes of the various live broadcasts, including The Sound of Music, The Wiz, and Jesus Christ Superstar, there haven’t been any onscreen calamities. With TV and film, we certainly hear about actors sustaining injuries on set, and filming is reshuffled accordingly. But with live performance, there are no delays or second takes. So when that live performance is being seen not just by 1,100 people in a studio, but 3.5 million on TV, back-up plans seem essential. By broadcasting the dress rehearsal, Fox TV was sending out a performance that, while it looked live, was not. And most people in the business know how performers, anticipating that one moment to shine, might hold back waiting for the big night, never expecting that their rehearsal performances might prove, in fact, to be that big night. 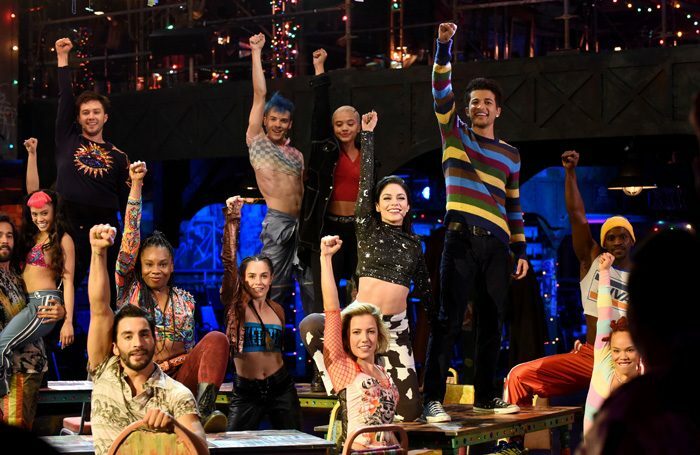 Surely no one will plan live theatre broadcasts again in quite the same way, given the lesson of Rent (it will be interesting to learn about the mid-May plans for Hair’s live broadcast version, officially announced on Monday). But since the broadcast looked live – it was revealed to viewers at the first commercial break what had happened, what they were seeing, and how the last sequences had been changed – it calls into question why musicals for TV can’t be shot live-to-tape, as outmoded technology once had it, with the opportunity for fixes and pick-ups. To keep up energy and pressure, it could be done only hours before broadcast. That way the studio audience would still generate the needed connection between performers and fans, and the experience for the viewing audience would be essentially unchanged. A hybrid should take advantage of the best of both worlds. But no matter what, understudies seem like a good idea, don’t they?